Is Sales Marketing an art or a science? In business, that question is frequently, and fittingly, asked of Sales and Marketing. Good marketing and sales people know how to work the “magic” that creates good leads and closes sales. If you ask them how they do it, however, they may not be able to explain it. Many sales and marketing veterans operate through an intuitive feel they have created through observation and experience, but it is not something they can easily define or describe. WHO NEEDS SALES & MARKETING POLICIES AND PROCEDURES? Simultaneously testing two alternatives, labeled “A” and “B”, prior to launch to see which gets the better response. Act of announcing publicly by printed notice, broadcast, word of mouth, or other means; calling public attention to a product/service, especially by emphasizing desirable qualities so as to arouse a desire to buy or patronize; promoting. A description of the objectives to be achieved by an advertising program, the target market to be addressed, the message to be conveyed, the advertising approach and strategy, the timeframe, the budget, the means of evaluation, and possibly other factors. Research conducted to improve the efficacy of advertising. It may focus on a specific ad or campaign or it may be directed at a more general understanding of how advertising works or how consumers use the information in advertising. It can entail a variety of research approaches, including psychological, sociological, economic, and other perspectives. Expert who gives advice; one who gives advice to or within a group. Respondents to an advertised or posted position with the sales staff. Public with whom the Company is communicating. Graphics image linked to an advertiser’s website; also known as an “ad banner” or “online ad”. Rough estimate of project costs, usually expressed as a range, which is finalized once the contract is awarded. A budgetary estimate is used when the cost to the Company to generate a firm contract amount is high relative to the amount of the contract and the likelihood of receiving it. A work center equipped and staffed with trained Customer Service Representatives to handle incoming customer phone calls. several related operations aimed at achieving a particular goal, usually within geographical and temporal constraints; a coordinated program of advertising and promotion. Applicants selected for interviews, and are being considered to fill a sales staff position. Software that keeps track of items web site visitors select for purchase until they proceed to the “checkout” page; the interface between a company’s web site and its infrastructure that allows visitors to select products, review and modify their selections, and purchase. Also referred to as “shopping cart”. High-level person in the organization who supports and promotes the product, project, plan, etc. ; person with sufficient clout in the organization who believes in and sells the idea and helps solve problems between groups; member of senior management responsible for logistical and business aspects of the program, plan, etc., as well as removing barriers to program and individual success. Site visitor clicks on a banner ad and is transported to the banner advertiser’s site (landing page); also known as a CTR, “click-thru rate”, “ad click”, or “transfer”. A complaint that has been resolved, usually based on an action or result that satisfies the customer. A complaint that was not resolved in a way that satisfies the customer, but requires no further action or contact. (adj.) Serving to support or reinforce; (n.) Material traditionally developed and provided by Marketing to help Sales focus on the customer needs analysis, build a case for the product, help the customer understand the value of the product, offer proof points, ensure that the buyer sees and understands that the Company’s product provides the most effective solution to their problem, and target specific scenarios based on a customer’s industry and job function. The quality of being adequately or well qualified physically and intellectually to perform particular tasks. Selling price of a product less variable costs (cost of goods / materials); contribution margin ratio = (sales – variable costs) / sales. Example: a marketing manager determines that a particular ad vehicle (a banner ad) has a 35% contribution margin. The manager compares that with contribution margins of other vehicles to determine if spending on vehicles should be modified and alternatives explored. Communications media where the Company can control the content, timing of communications (e.g., direct mail, e-mail, blogs, web site copy/content). Document that provides information or direction for performance of work and is part of a controlled document system. Characteristics of control include such things as revision number (or letter), signatures indicating review and approval, and controlled distribution. Group of independent, but interrelated, elements that serves to control the development, issuance, capture, revision, versioning, and integrity of documents; also known as a “document control system” or “document management system”. Percentage of visitors to a commercial web site taking a desired action (e.g., product purchase, newsletter subscription). The percentages or ratios at which numbers in the sales pipeline are converted (i.e. % suspects converted to prospects…% sales calls converted to sales opportunities). Commercial off-the-shelf; products manufactured commercially and tailored for a specific use. Compare COTS products with those produced entirely and uniquely for specific applications. Information from customer contacts, and for next customer contact. A readily accessible physical or electronic file containing records and forms about customer calls to the call center. The process of planning and carrying out varying interactions with customers in order to improve customer product implementation and customer relations, improve products and services, and improve internal processes. A description of the phases that consumers while buying, or not buying. Demographic characteristics or attributes learned or assumed about typical customers. Multiple profiles can exist for each product or service. Customer needs translated into technical requirements for the product or service; customer wants in stated or impliedterms. Named for W. Edwards Deming, who recommended placing business processes in a continuous feedback loop, or cycle, so that managers could identify and change the part(s) of the process that need improvement. Deming thought that business processes should be analyzed and measured to identify sources of variation that cause products to deviate from customer requirements. Advertising sent by letter/parcel carrier directly to a target market, usually about a product or service, and designed to evoke a positive response (e.g., visit, inquiry, or purchase order). Communicating directly with a customer or business to generate a response in the form of an order, a request for further information, or a visit to a store or other place of business. The acronym “DM” is often used to refer to direct marketing as well as direct mail. Promotional method that solicits an immediate and measurable response, usually by mail and the Internet and occasionally by phone. Changeable Information and its supporting medium; the medium may be paper, magnetic, electronic, optical, photograph, or a sample of the Company’s product. Information and its supporting medium; the medium may be paper, magnetic, electronic, optical, photograph, or a sample of the Company’s product. Document that provides information or direction for performance of work and is part of a controlled document system. Characteristics of control include such things as revision number/letter, signatures to indicate review and approval, and controlled distribution. Specific function held on a specific date or period of time including, but not limited to, accommodations, services, and other facilities; summit, symposium, or conference with current or potential customer invitees, focusing on content designed to improve sales or customer relations with this or a related audience/market group. Examples: a professional organization’s monthly meetings; annual conferences; conventions. Document originating outside the Company that provides information or direction for performing activities (e.g., artwork, catalog, software instruction manual). One (preferably issue-neutral) who guides a discussion or activity; person external to a group whose purpose is to help the group work more effectively. Document or web form with spaces in which to write; business document that typically contains some predefined data and designated, labeled areas for filling in data. Printed, typed, or electronic document with blank spaces for insertion of required or requested information (e.g., order form). (v.) halt shipment/distribution of product found or believed to be not in conformance. Viewing of a page or ad by a user (based on the assumption that the page or ad images were successfully downloaded and viewed by the user); one display of an ad. For example, if one page has four ads, that counts as four impressions. Document of internal origin (i.e., developed entirely within or completed by the Company) that provides information or direction for the performance of activities within the scope of the Sales & Marketing Management System (SMMS). Examples include, but are not limited to, the procedures contained in the Company’s SMMS manual. Feature of a material, part, or process, variation of which will significantly influence a product’s fit, performance, service life, or manufacturability. Key characteristics essential to meeting product goals are identified so that the Company’s resources can be focused on those items. A word or phrase entered in a search engine by the user; also known as a “search term”. Keywords are the heart of Internet marketing and, in particular, pay-per-click advertising. (v.) Start (a new product, campaign, etc. ); introduce. (n.) Process of starting or introducing. Any potential customer whose name and/or information was garnered through sales, marketing, or advertising techniques, as in lead generation programs. A brief questionnaire form (available through trade shows, web pages, and advertising tear cards for example), that has been completed and submitted by a potential customer. Cover letter that introduces a document such as a report to the reader, typically with less formality than the report itself; reminds the reader of highlights (points of interest) and may present sensitive or confidential information related to, but not part of, the report. A letter of transmittal typically includes: the name and address of the recipient of report in the inside address; information about what is being sent; follow-up action expected of the reader; and an offer of continued communication or clarification. The world of potential customers. 1. A folder/envelope containing a variety of information on the Company, which may include: (a) a Company information sheet; (b) a product information sheet (especially if the Company is doing anything new or innovative); (c) product photos; (d) customer testimonials; and (e) brief biographies of key personnel. 2. A folder/envelope containing information on the advertising medium (print, Internet, display, TV, etc.) – circulation, ad rates, demographics, schedules/calendars, etc. Generally, the person who calls the meeting and sets the agenda; responsible for organizing and guiding the meeting and following up with participants. Record of the proceedings of a meeting. Product that is not (i.e., does not perform) in accordance with customer, standards-based, customary, or statutory/regulatory requirements. Something toward which effort is directed; an aim, goal, or end of action. In business terms, a well-worded objective is Specific, Measurable, Achievable, Result-oriented, and Time-bound (SMART). Statement of attainable, quantifiable achievements that help accomplish goals contained in the comprehensive plan. Objectives are subordinate to goals, narrower in scope, and shorter in range. A complaint that is received and still in process, or other customer feedback that has not received a response. Information for order entry, order tracking, and order history. Process by which Web users visit web sites having unpaid search engine listings, as opposed to visiting pay-per-click listings displayed among search results; also called “natural search”. System of written and unwritten rules for orderly conduct of business/meetings; “Robert’s Rules of Order” is one example of parliamentary procedure. Technique whereby an advertiser bids on keywords it believes its target market (people or companies it thinks would be interested in its offer) would type in the search bar when they are looking for their type of product or service. For example, an advertiser selling red widgets would bid on the keyword “red widgets”, hoping a user would type those words in the search bar, see their ad, click on it and buy. These ads are called “sponsored links” or “sponsored ads”. Specific audience or public the Company wants to influence; persons or organizations whose attitudes and behavior the Company wants to affect. Stakeholder expected to directly benefit from or be adversely affected by the project. Examples include the Company, its customers, investors/shareholders, and employees. Process or series of acts involved in a particular form of work; detailed elements of a process used to produce a specified result. Activities designed to garner attention and awareness of the introduction of new product or service, and to provide for a smooth and coordinated introduction. Dividing the life span of a product or service into distinguishable phase or periods, and then creating management plans for each phase to maximize the benefits to the company and to customers over the life of the product. Product Management plays a vital function in coordinating efforts of different organizational departments to support a product or product line through its life cycle in order to maximize the benefits, to the company and the customers, of producing and selling the product. Product management includes functions such as Product Life Cycle Management, Product Launch, and Product Development. Proof (of a concept, idea, etc. ); something that induces certainty or establishes validity in the mind of the potential customer. Group of people with similar interests. Building relationships with the public and stakeholders in order to change attitudes and bring about desired behaviors. Set of activities designed to generate goodwill toward the Company and/or its product; group of activities or events that help promote a favorable relationship between the Company and its customers, suppliers, partners, and the public. A PR Plan to achieve a public relations policy. A business, organization, or individual identified by the company as having: a current or impending need; the resources to purchase or lease the Company’s product; and the authority to purchase/lease. Structured approach to defining customer needs or requirements and translating needs into specific plans to produce products to meet those needs. The stated and unstated customer needs or requirements are captured in a variety of ways (e.g., direct discussion, surveys, focus groups, customer specifications). This understanding of the customer needs is summarized in a product planning matrix or “house of quality”. These houses of quality are used to translate higher level needs into lower level product requirements or technical characteristics that satisfy those needs. (v.) Remove a product from the market primarily because using it may cause health problems or possible death. (n.) Request to return to the maker a batch or an entire production run of a product, usually due to discovery of safety issues. A recall is an effort to limit liability for corporate negligence and/or to improve (or avoid damage to) public relations. A recall may be based on an internal or external finding (e.g., consumer complaint). A recall is sometimes known as a “withdrawal”. Anything (e.g., document, photograph, nonconforming product sample) retained to provide and preserve permanent evidence of or information about an event (e.g., document (sales order, activity log), photograph, product sample). How well a given web page matches a user’s search for information. Search engines use relevance algorithms, often based on frequency of word/phrase occurrence. If the phrase “policies and procedures” occurs on a given page, that page has relevance to a search using the word “policies” or “procedures”, but even greater relevance to a search using “policies and procedures”. Page relevance depends on how often those words occur on a page, whether they occur in the title and/or headings, and so on. Some relevance algorithms involve thesaurus or synonym ring lookup. An invitation for suppliers, through a tender process, to bid on a specific product or service. An RFP often involves more than price – it can include Company information and history, financial information, technical capability, product information, and customer references that can be checked to determine a company’s suitability. RFPs generally include specifications of the item, project, or service for which the proposal is requested. The more detail in the specifications, the greater the chances that the Company’s proposal will satisfy the customer’s needs. Condition that must be met in order to do something; something wanted or needed; something essential to the existence or occurrence of something else. Percentage of recipients who respond (direct mail ads); percentage of impressions that result in clicks (Internet ads). The rule of thumb in the US and Europe is a 2% response rate; estimates in various industries range from a fraction of a percent to 4-5%. Sales assistants in the sales department assist with various sales functions, including qualifying leads. The set of procedures for determining and implementing the Company’s intentions regarding Sales and Marketing. Company or product marketing pieces (e.g., brochures, cards, displays, Company web site) used to build awareness or make an offer; used in meetings, sent by mail (e-mail), or displayed at point of sale. The average or typical period of time it takes to close a sale from the initial marketing or sales contact until an agreement to purchase. The sales cycle can vary from a few moments to several months, depending on the complexity and cost of the product of service, and industry standards. All members of the sales department including sales staff, sales administrators and assistants, managers, and can also include customer service representatives, and order entry staff. Properly designed processes implemented through well written procedures are important in carrying out Sales & Marketing administrative functions. 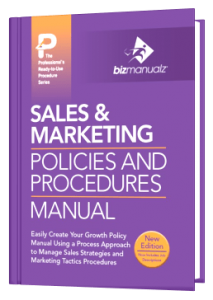 The Bizmanualz Sales and Marketing Policies, Procedures, and Forms also include procedures on Document Control and Record Control which applies these important ISO requirements to Sales & Marketing administration. Other including administrative procedures include Sales Hiring, Sales Compensation, and Sales Training. The numbers needed at various stages of the lead and sales process to reach sales goals (i.e. number of prospects, number of leads, number of sales calls, number of sales opportunities, and number of closed sales). The professional sales staff that conducts sales calls, makes sales presentations, and prepares proposals and quotes. A critical aspect of conducting a sales call is to have a plan and collect information while performing the plan. Through the P-D-C-A methodology, the information collected and employed relates directly to a particular business and the products and services being sold. Person responsible for keeping the minutes of the meeting. Document retrieval system designed to help find information stored on the World Wide Web. The search engine allows the user to ask for content that meets specified criteria (i.e., keywords) and retrieves a list of items, sorted by resultrelevance, matching the criteria. Examples include Google, Yahoo! Search, and Ask. Building the correct phrases and terminology into your site will allow your site to come up as a result in search engine queries. Persons or organizations that can intervene on the Company’s behalf and influence its primary audience. Stakeholder with an indirect role in the project. Examples are unions, banks and other lending institutions, governments, competitors, and goods/service providers. Spatially isolate recalled product from other products (until such time as the recalled product may be safely disposed). Subject matter expert; someone who has specialized knowledge of/experience with a particular subject. Person who speaks on behalf of individuals or groups but is not necessarily one of those individuals/groups represented. Internet ad containing keywords purchased by the advertiser, usually appearing next to or above the organic results on a search engine results page (SERP). The advertiser pays only when a search engine user clicks on the sponsored ad. Also called “sponsored link”. Identifying stakeholders, assessing their needs and interests, and determining how their needs and interests may affect project risk and viability. Web site’s ability to attract visitors back to the site more frequently. Personal home pages, customizable interfaces, and web-based e-mail services are examples of sticky services. Overarching goals for achieving product launch (i.e. creating awareness of the product for existing and potential customers). Group of employees chosen by the Company President to develop goals, strategies, vision and mission, and Company plans (e.g., Marketing Plan). Statistical information collected about customers and the marketplace. Specific activities planned to achieve strategic goals (i.e. create content, select media mix, and allocate budget for advertisements). The population identified as most likely to respond to an offer for a specific product; usually it is classified by geographic location, demographic information (e.g., age, gender, economic status), and product purchase and usage behavior; also known as “target audience”. Process by which a business or government entity seeks quotes for a particular project (e.g., part fabrication, assembly) to be carried out by a contractor or subcontractor. Special publics, composed primarily of organized clubs, councils, associations, etc., that can mobilize quickly and endorse your cause; usually have established means of communicating with members (e.g., newsletters, e-mails). Person responsible for keeping meeting participants informed of the time; the idea of having a timekeeper is to keep the meeting moving, ensure that all agenda items are addressed, and not have the meeting go longer than its allotted time. A group of company officials comprised of the Company’s chief executive officer and chief financial officer, at a minimum. Any interaction a company has with potential or existing customers, including advertising, web pages, sales team, and customer service staff. Exhibition for companies in a specific industry to showcase and demonstrate their new products and services, or an exhibition of businesses offering franchises and/or business opportunity packages for sale. Trade shows are not normally open to the general public – only company representatives and members of the press are invited. Any formal or informal, organized effort or instruction to improve knowledge, skills, or competence levels. Document that is not a part of a controlled document system. Net, or unduplicated, reach of a website over a specified time frame; important metric for measuring website traffic, particularly in combination with page views (e.g., total page views ÷ unique visitors = page views per unique visitor (an indicator of website “stickiness”)). Process of evaluating a system or component – during or at the end of the development process – to determine if it satisfies specified requirements. Total number of people who access a website over a certain period of time; also known as a “user session”. Measuring behavior of website visitors; in commercial context, measuring which aspects of the website work towards the business objectives (e.g., which landing pages encourage people to make a purchase). Process of designing the Company’s web page(s) to rank high in search engines, or have greater search relevance. For a step in a process, the instruction(s) on how to perform that step, sufficiently detailed to allow an inexperienced person (novice) to perform the work.